This product meets Green Seal™ Standard GS-37 based on effective performance, concentrated volume, minimized/recycled packaging and protective limits on VOCs and human & environmental toxicity. Please see GreenSeal.org for more info. In only one easy step, the Brulin 'TerraGreen Neutral Cleaner' can safely remove dirt, grime, and other environmental pollutants from your wood floors and other hard surfaces. It is a Green Seal Certified cleaner that requires no need to rinse, polish, or buff your sealed hardwood floors after cleaning! There is no sticky hazy build up, it is a natural clean shine. The canteen, quart containers conveniently house a measuring device to increase efficiency and decrease waste. No more uselessly adding too much chemical to your water, which often times leaves a haze behind after your done mopping your wood floors. Simply mix this wood floor cleaning solution 1 part solution to 512 parts water (1:512). That's 1/4 ounce of solution per gallon of water! That means that this quart canteen makes 128 gallons of ready to use wood floor cleaning solution! Take a look at our complete line of floor cleaning soaps, or our specialty stone care products for other options. Improper use or dilution could result in damage to cleaning surfaces or to personal health. Please follow label directions. 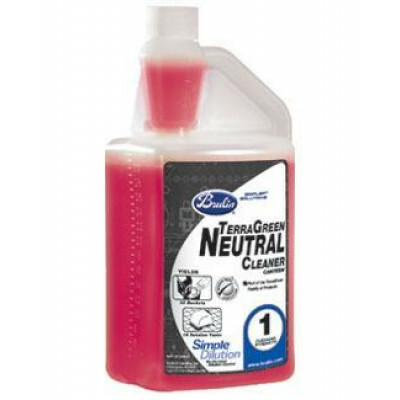 Please check out our full line of environmentally responsible cleaning products for other options. 1 step cleaning, no need for rinsing. Non-toxic and safer to use around your family and pets. No harsh chemicals like ammonia or bleach that can damage sealed wood surfaces. No unpleasant aromas or caustic odors, leaving behind a pure, terrific blooming citrus scent. No sticky, oily, hazy, or cloudy build up left behind. Leaves behind a streak free surface, with a clean and natural shine. Has a health rating of 1 (In-Use) and USDA rating of A1 (LG). Customers who were interested in the Brulin® TerraGreen Neutral Cleaner for Sealed Wood Floors - 6 Quarts were also interested in the following items. This is a review for the Brulin® TerraGreen Neutral Cleaner for Sealed Wood Floors - 6 Quarts.